Editor’s Note from Brian: The purpose of this post is to give you some ideas on how to organize your practices in a way that you cover what you need to cover for your system. Every successful basketball coach is a master teacher of the game. Just as excellent teachers who teach any subject, the outstanding “teachers of the game of basketball” must be certain that he/she thoroughly teaches every facet there is of the game that he is coaching. 3) the evaluating and critiquing of the practices (done after the practice has concluded). It is of utmost importance to successfully perform all three components to have informative, worthwhile, and therefore worthwhile practices to prepare your players for absolutely anything and everything that could possibly happen in a game. This is done in order for those players to be prepared and ultimately to be successful in their games. This third component of the administration of basketball practices sometimes can easily be omitted, forgotten, and ignored. It is a requirement for successful programs to devise an overall master plan of each of the daily practice sessions. 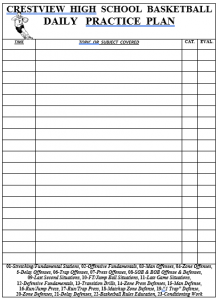 This tool aids a coach to plan ahead and also to keep a season-long summary of past practices to record every aspect and phase of the game. This ‘diary of the practices’ should illustrate the frequency and the quality of each and every drill and activity of every practice session. The ‘MASTER PRACTICE PLAN’ is an invaluable instrument that will help a coaching staff insure that every fundamental, every drill, every skill, every rule, every aspect of the game is taught and practiced. 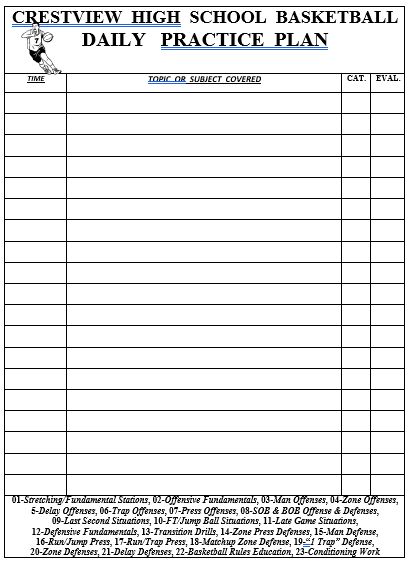 Each activity is documented and accounted for, and evaluated. This should help the staff from having any ‘practice slippage’. Nothing is then assumed or forgotten by the coaching staff. Every phase of the game is effectively and efficiently taught, reinforced, practiced, and repeated for the players’ development in an organized system of practice planning. 4) as well as the overall practice’s ‘major points of emphasis’ for that day. For the coaching staff’s recordkeeping and evaluation purposes, each drill/activity can (and should be) classified into one of the twenty-one categories, with the amount of time spent, as well as the staff’s overall evaluation of that drill/activity. 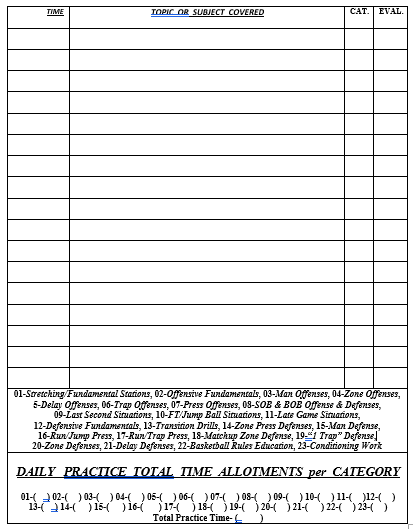 The ‘DAILY PRACTICE PLAN’ keeps the coaching staff focused and on task, avoiding the many types of distractions that can take place to prevent the staff from accomplishing what they have attempted to set out to do in that day’s practice. It also becomes an instrument to where they can critique and evaluate themselves, the practice, and their team’s daily and overall progress. a) Options (Chase & Stagger, Chase & Lob, Veer Cut, Early Ball-Screen, Late Ball-Screen.